You can invite your friends and circles (groups of contacts) to play with you in Google+ Games. The ability to invite people to specific games may be in a different spot in every game, although it’s fairly evident because they always want more players. In the game, you can share things like your score and then entice the friends you invite to do better. This is a great way to nudge friends to see whether they can do better than you. After you invite your friends to play, when your friends go to their Notifications page they’ll see your invitation right in their notifications stream, as shown in the following figure. 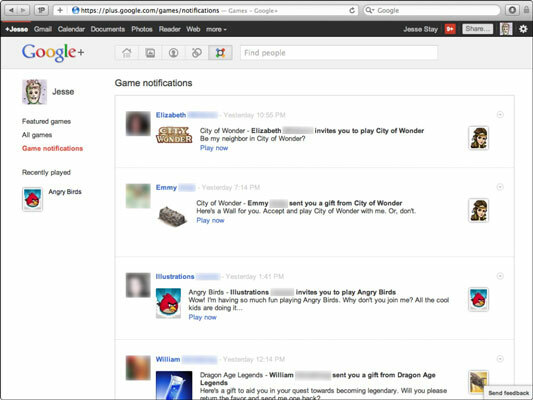 The Google+ Game Notifications page. Play the game and complete a level. Click the leaderboard icon under your list of friends and their ranking. You’re taken to the leaderboard page. Click the Invite Friends button. A dialog box that looks like the following figure appears. Inviting your friends or circles to play a game in Google+. Choose the friends you want to invite. You’ll see the invite as it will appear to your friends. Make sure that’s okay and click Send to place it in your friends’ notifications stream.